Looking at the diagram, it’s striking how Paris is surrounded by relatively empty academic space. The other big university poles would seem, in fact, to be as far from Paris as possible, at the southwest or southeast or far northern corners of the country. As if outside Paris there was an academic void for a while and major university centers only sprang up again when they could begin to escape its presence. 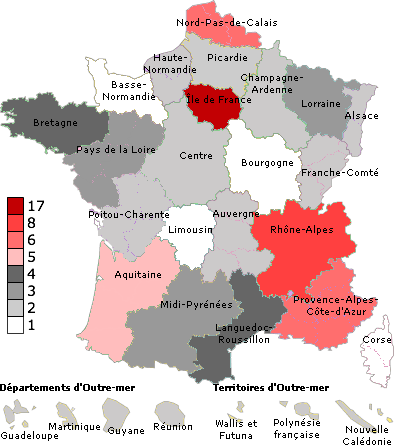 The smaller red regions are far from the capital city. All the same, I should acknowledge that this is probably a moderately misleading map. It doesn’t show number of students or number of teachers or institutional prestige, and these don’t always vary directly with the mere number of universities. In fact, it seems that when a city has multiple universities, they often began as one institution and were organizationally separated at some point. The University of Paris, after all, began as one entity and now there are 13 of it; 13 separate Universities of Paris, I mean. So sheer number of universities in a territory is not itself a conclusive measure of much. But I do think if we mapped out student populations on the same map we’d find a roughly similar distribution, and this map does help visualize the Parisian center—provincial periphery system that continues to organize academic space in France. Nothing like it exists in the United States, where the most prestigious universities tend to be somewhat spaced out and located in different cities (they once primarily served students from their own regions, I suppose); of course there are major university cities like Boston and New York, but no single center is dominant. That said, even within Paris there is enormous intellectual stratification, amounting to a center within a center. The oldest and fanciest institutions are clustered in the Latin Quarter right in the center of town not far from the centers of French government, as if spatial proximity to the French State went hand in hand with intellectual dominance in the academic world, while the universities of the outskirts (banlieues) are often poorer, serving more working-class students in poorer conditions, as in Paris-8 in Saint-Denis where I’m working this year. If you wanted to say something abstract about this, you might observe that it’s curious how national space symbolically structured according to these sorts of status differentials, which moreover form a sort of fractal where every center has its own internal periphery and every periphery appears to have its local center. Within Paris there is another periphery; and then again even within the center of the Parisian center we can still find marginal zones; and yet still within the periphery of the Parisian center, as at Paris-8, there are still smaller zones of dominance and zones of social abandonment. I was just hearing about Alexandre Bikbov’s research where he asked people to draw maps of how they see their social world: and it crosses my mind suddenly as I’m writing that it would be tremendously interesting to ask people to draw me maps of the French university world as they picture it.